BMW's Spartanburg factory has begun building the new X4 crossover, which is to go on sale in June in the United States. SPARTANBURG, South Carolina. -- BMW will invest $1 billion in its factory here by 2016 to expand capacity by 100,000 units and add production of a fifth crossover, the X7 -- making the plant its biggest worldwide. BMW will increase capacity the plant to 450,000 units. Spartanburg’s annual production will top that of BMW’s Dingolfing, Germany, plant, which has a capacity of 350,000 units. Spartanburg’s current capacity is 350,000 units. Last year, the plant produced 297,326 vehicles. “This is the fifth expansion since production began 20 years ago and represents another major investment,” Manfred Erlacher, president of BMW Manufacturing Co., said. 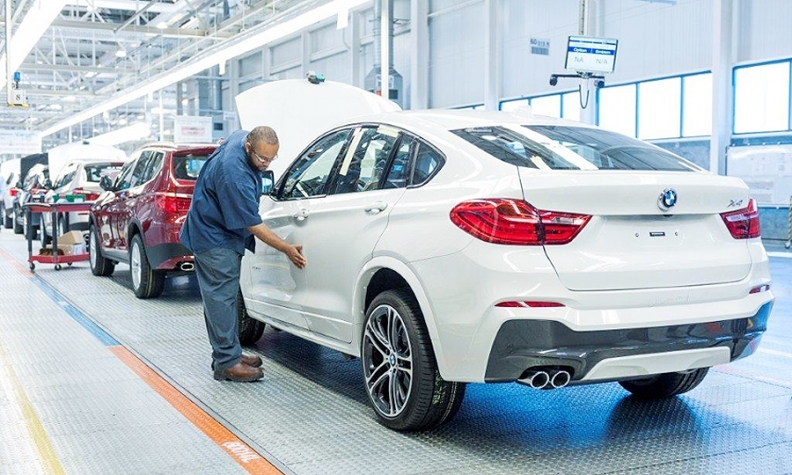 The plant has begun building the new X4 crossover, which is to go on sale in June in the United States. Spartanburg also produces the X3, X5 and X6. Harald Krueger, BMW board member for production, said the group has 28 factories in 13 countries. More than 70 percent of the plant’s production is exported to more than 140 countries worldwide, he said. “And we are really proud that this plant annually exports vehicles valuing over $7.5 billion -- which, according to the U.S. Department of Commerce, makes BMW the largest U.S. vehicle exporter by value to non-NAFTA countries. ‘Freude am Fahren’ -- made in America,” Krueger said. The United States is the second-largest market for the BMW Group worldwide. It is the largest market for Mini and Rolls-Royce and BMW M high-performance cars. The United States is expected to be a major, if not a leading, market for BMW’s new i electric and plug-in hybrid cars. The factory, dealers and direct suppliers employ nearly 70,000 people in the United States. BMW executives provided no details on the new seven-seat X7 that is expected to go on sale in 2017 or 2018 in the United States.